As I am a first generation Dubliner, I don’t mind admitting that my heart lies firmly over the River Shannon and in the West of this amazing country of ours! I am most at home when I get the chance to go back and visit. So, after a lot of thought, and missed opportunities, Hubs and I decided to head out West, to catch up with old friends, and new. My Twitter pal, Móna Wise was launching her cook-book recently, and, what better reason, among others, than to jump in the car, and Just Go! 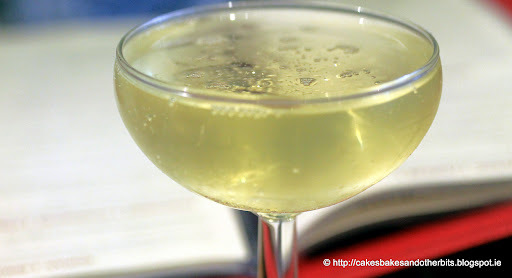 After asking on Twitter for recommendations on where to eat, I was given several suggestions, and Cava on Lr. Dominick St. Galway, came up trumps! Owned and run by Husband and Wife Team, JP McMahon (Head Chef), and Drigin Gaffney, who incidentally, are the proprietors of two other restaurants, Massimo, and Aniar. This busy restaurant is like stepping in to any of the up-market eateries in Spain itself, places where the local residents go, the best kept secrets from tourists! Having said that, Cava is no secret with the residents of Galway, and there were plenty of tourists there on the nights we visited! While reading the menu and trying our best, with help from the Staff, to choose what to eat, we each ordered a glass of Cava to start the evening. Why not, considering! Irish ingredients are used as much as possible in the dishes. The wine and sherry list is extensive, and covers all regions of Spain, so there is something to suit everyone. I love tapas-style eating, and the portion size is balanced enough without leaving you too full to enjoy more. Each dish has just enough for two people to share quite happily. I did remark to Hubs that not once did either of us need to use Salt or Pepper on our dishes. Perfect seasoning, in my humble opinion! The restaurant was very busy, but you would not know that, with the level of service, from both Kitchen and Front of House. We enjoyed lots of dishes that evening, and having taken so many photographs, deciding which to use was difficult! Here is an overview of our choice. From the Pintxos menu, we chose Serrano ham, Manchego Cheese & Quince. 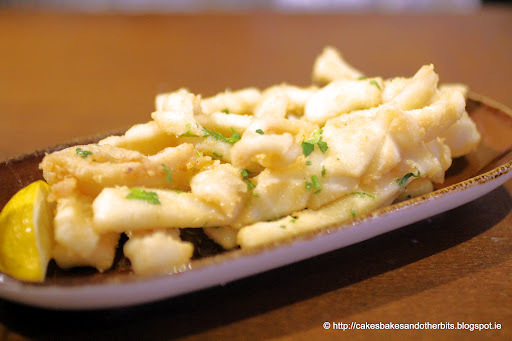 We then moved on to the Pescados & Mariscos (Fish & Shellfish) and opted for Fresh Fried Squid, with garlic & parsley. I only like a hint of garlic with fish, and this was just right. 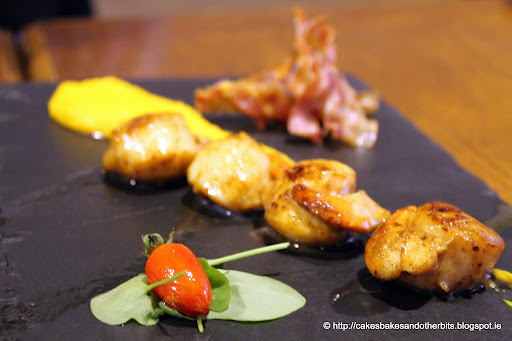 We also had Irish Scallops, Pancetta Crisps, and Sweet Potato Purée. 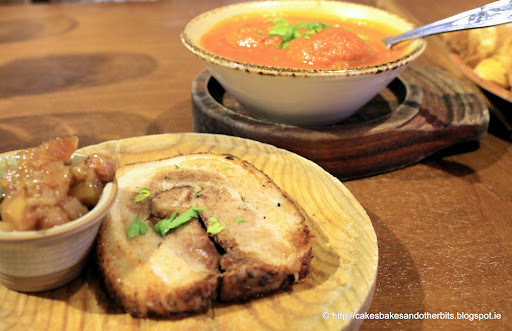 From the Carnes options,(Meat), we chose 2 dishes, the 10-Hour Confit of Cured Pork Belly with Apple Compote, and Traditional Spanish Meatballs in Tomato Sauce. 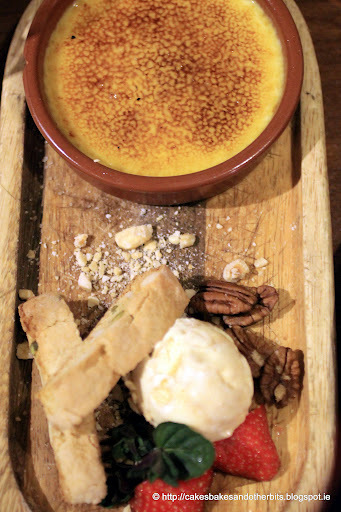 Leaving just a bit of room for dessert, Hubs went for the Crema Catalana (Creme brulée with crème brulée ice cream). 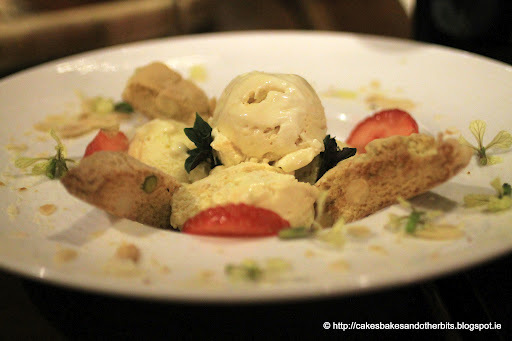 I had Honeycomb & Cinnamon ice-cream with Pistachio Biscuits. 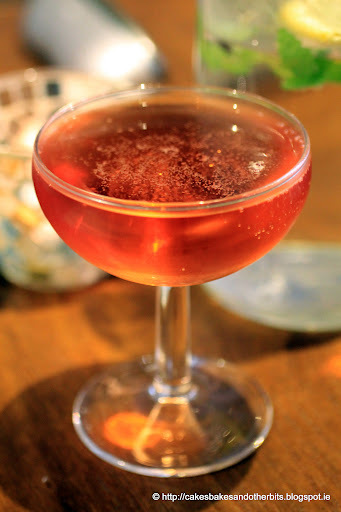 We loved the atmosphere and every aspect of the food at Cava, and when in Galway, you really must include a visit there, as you will not be disappointed. Disclaimer: All meals and drinks were paid for in full. No favours asked for or given in return. 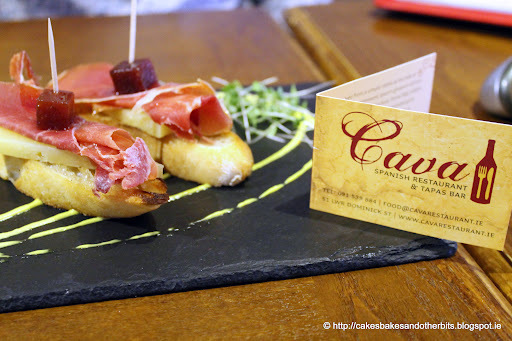 Unfortunately, due to circumstances beyond their control, Cava sadly closed on 25th January 2013. 9th August 2013: Update: I am very pleased to report that Cava Restaurant will re-open on September 12th 2013, as Cava Bodega (under the same ownership as before) , and has a new location on Middle Street, Galway. Previous Post "She Writes, He Cooks"